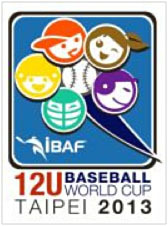 The International Baseball Federation (IBAF) releases the schedule for the II IBAF 12U Baseball World Cup, which will be held from July 18 to 28, 2013 in Taipei City. 16 teams will participate with games being played at Tien-Mou Stadium, Youth Park and Shing-Sheng Stadium. The round robin preliminary phase is scheduled for July 18 to 25 with July 23 being a rest day. The top four teams of each pool advance to the final round, which will be played in a single-elimination format. Quarterfinals are set for July 26, semifinals for July 27 and Gold Medal, Bronze Medal and classification games for July 28. The inaugural edition of the IBAF 12U Baseball World Cup was won by Chinese Taipei with a thrilling win over Cuba in the Gold Medal Game in July of 2011 (RESULTS). In 2013 the United States of America, Pakistan, Russia, Colombia, India, Panama and the Czech Republic will send teams to the IBAF 12U Baseball World Cup for the first time. Chinese Taipei, Brazil, Korea, Japan, Philippines, Hong Kong, Venezuela, Mexico and Italy are returning participants. The first game day of the first round will be highlighted by duels between Korea and Brazil, Team USA and Panama as well as Chinese Taipei and Colombia. Color-marked games in the schedule will be TV games. The use of the curveball will be permitted at this tournament after a decision by the Executive Board earlier this year. However IBAF will remain committed to protect the health of young athletes through the rules of pitch count limitations and other restrictions.